Fortnite Battle Royale Mobile is now available for mobile on iOS devices. However, as announced recently by Epic Games, the Android version is on track and if you are interested in being the first to play it, you can register now. Meanwhile, we're going to tell you the 9 best tips and tricks to master Fortnite Battle Royale Mobile - because you rock! If you are here, it is because you want to know what are the best tricks and tips to master Fortnite Battle Royale Mobile, the mobile version of the successful battle royale of Epic Games, and win as many games as possible. As we explain below, the controls of Fortnite Battle Royale Mobile are different from those of the console and PC version. Therefore, you may find it more difficult to control the camera. If so, we advise you to evaluate this control, if it is too fast or too slow, during the first games. In general, it is better to turn quickly by making short touches on the screen, but it depends solely and exclusively on how comfortable you are with the movement. Similarly, the mobile version of Fortnite is different because it has visual indicators that show where sounds come from. Having an indication of the origin of a sound can quickly provide you with a large amount of information about the location of another player, which will allow you to sneak up on you and have an advantage if a fight occurs. Using the visual signals and listening at the same time will allow you to find your enemies much faster than you could do in other versions of the game. Aiming at Fortnite Batlle Royale Mobile is much more difficult than on consoles and PCs, because it has a much smaller screen and less precise controls. For this reason, we recommend that you do not go crazy firing, because in this case the accuracy is important. To increase it, the only thing you have is to crouch while shooting. It will make you lose mobility, but it will give you some advantage. You already know that building in Fortnite is very important, especially when the end of the game approaches and there are only a few players left alive. If you build on the walls walls to protect or stairs to see over other players, you can be sure that you will be getting a significant advantage, especially if a fight occurs. Likewise, building can be useful to navigate the map avoiding all obstacles that may exist. If you press twice the virtual stick of your character, it will run automatically, although you will lose control slightly. However, this action is very useful when you have to investigate a large map, because it allows you to focus on finding boots or enemies thanks, in addition, to the visibility of the screen you earn by removing the thumbs of the mobile. Playing on mobile is not the same as playing with a larger screen such as a computer or a television and causing the ability to shoot farther away to be lost. Therefore, we advise you, whenever you can, to fight at close range, because shooting farther could not be effective and would alert the other player of your presence. However, we leave you our guide on where to find weapons with a silencer. Although Fortnite Battle Royale Mobile is practically the same game that is available on PS4 , Xbox One and PC, it has different controls. 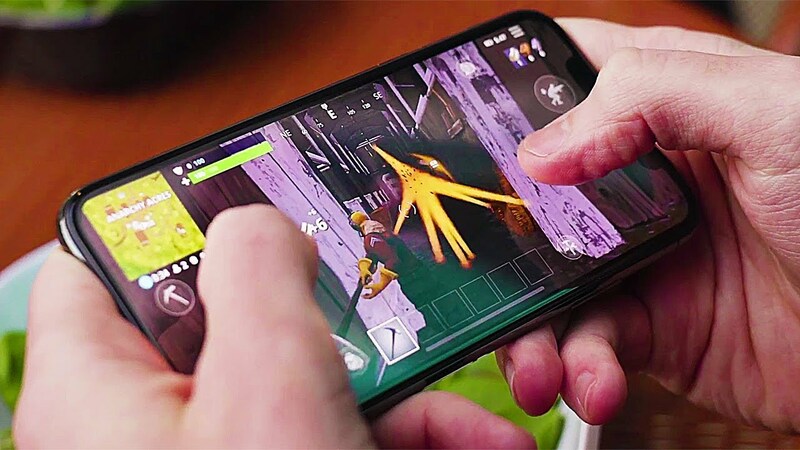 Unlike previous platforms, the mobile version of Fortnite uses touch buttons spread across the screen to perform any action. For this reason, and although you are veteran players of Fortnite, we recommend that, if you want to master the game, learn to use the controls of the mobile version. Although you think that accumulating objects in the inventory automatically is useful, in reality it is not, because you accumulate objects of low quality and you lose time when you want to get rid of them later. For this reason, we recommend that you activate the touch option to search and interact, which you can find in the Settings menu. In battle royale games like Fortnite it is very useful to listen carefully, because, usually, enemies are usually heard before seeing them. However, we usually play without sound on our mobile when we are in public. Therefore, we recommend that you use helmets because, although Fortnite Batlle Royale Mobile has visual indicators to know which direction sounds come from, it is always better to listen directly. The headphones will help you get a better idea of ​​the world and will probably save your life several times.